Made in Australia, Oceania, 1910-1940. 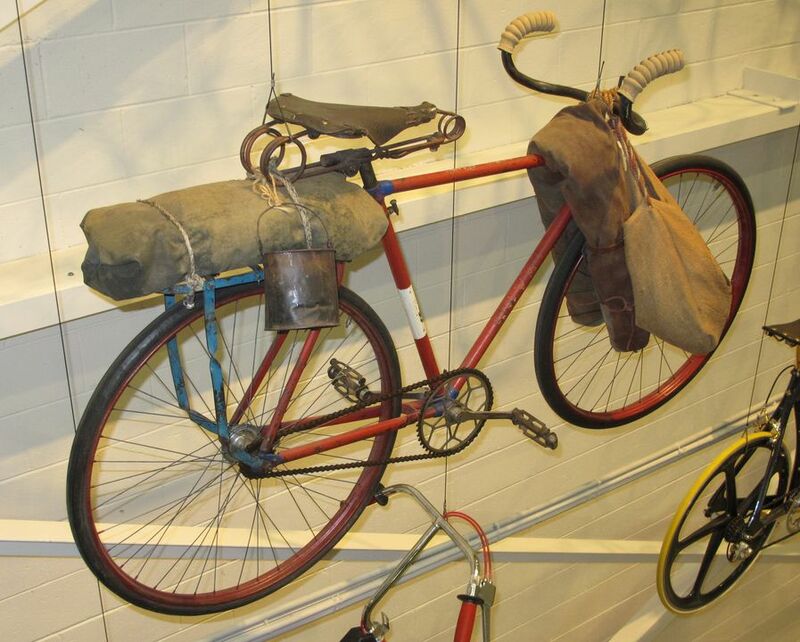 A safety bicycle fitted out with camping equipment of the type which would have been used by shearers in the early twentieth century to ride betweeen the sheds. The bicycle is a diamond framed safety bicycle fitted with curved handle bars which have rubber hand grips fashioned from gas masks. It also has rat-trap pedals with serrated edges, and a blue-painted heavy-duty metal luggage carrier over the rear wheel. The seat is a wide sprung leather type, made by Brooks, with large coils springs front and rear. The bicycle is finished in red, with the remains of a transfer with the wording 'Royal'. It also has a back pedal brake, headlamp bracket and aftermarket securing lugs for a tyre pump. The bicycle is fitted out with items which would have been used by a shearer or itinerant worker including a swag or bed roll placed over the top tube and tied down along the front forks with a leather strap and string. Tied to the handle bars is a twisted rope to which is attached a hessian bag which hangs quite low beside the front wheel. Another folded piece of canvas is tied onto the rear carrier with rope. A billy can is tied to the rear spring of the saddle. Nothing is known about the production of the bicycle other than the name 'Royal' in a transfer on the frame. This bicycle was the in collection of Jack Hepher. Mr Hepher was born in about 1915 and raced bicycles in the 1930s, competing six times in the famous Goulburn to Sydney race. He owned a bicycle shop in Campbelltown from the 1930s selling Carbine, and later, Speedwell bicycles. He sold his bicycle business in 1954 and, in 1976, bought Ye Olde Bicycle Shoppe in Bundanoon where he hired bicycles and restored pre-1940s bicycles. He retired to Mittagong and kept his collection of bicycles in a special garage/workshop next to his house. In 2003 an auction was held and most of his collection of over forty pre-1940s pedal bikes was sold. This bicycle was purchased at the auction by the donor who subsequently gave it to the Museum. It is thought that Mr Hepher set up the bicycle with the swag, billy and other equipment to show how it would have appeared when used by a shearer in the Australian bush. The writer, C.E.W Bean, travelled around NSW in 1909 and noted the huge numbers of shearers on bicycles which he later described in his book "On the Wool Track". He said that "the 'safety' push-bike had spread through the country as fast as the rabbit. It is extraordinary in what unlikely places one found those tyre tracks. They straggled across the very centre of Australia. We crossed them in paddocks as lonely and bare as the Sahara. Bicycles were ridden or driven or ploughed or dragged wherever men could go, and not infrequently where men could not go with safety". "The shearer set out on these trips exactly as if he were going from Sydney to Parramatta. He asked the way, lit his pipe, put his leg over his bicycle, and shoved off. For precisely the same trip, at that period, the average European would probably requisition a whole colonial outfit, compasses, packhorses". Bean also commented on the swags tied to the bicycles, "on every one doubled and tied fast over the handles and front fork, and often over the carrier and back fork as well, as tight and snug and curly as a white garden grub was the conventional swag. ?It is always rolled and strapped in three places with particular care. The outside roll is usually a canvas tent fly or a length of American leather; sometimes a warm rug of possum skins, home-stitched and tanned, leather side outwards".